This is an extended version of an article that appeared in the January/February 2015 issue of Dimensions magazine. We asked exhibit developers: What was the biggest challenge you faced in developing your brain exhibit or exhibition, and how did you address it? Here’s what they told us. Our biggest challenge: realizing that it was about the brain in the first place. 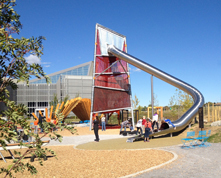 At TELUS Spark, we wanted to give our visitors a reason to go outside together on nice days. They were looking for “classical” exhibits that explored simple science. A counterpoint to the open-ended, inquiry-based exhibits already inside our building. We also knew that they wanted big FUN: gut-turning, thrilling things to do together. Our answer: a park with giant climbing structures, places to run and jump and play, and equipment to experiment with. We knew it was important fun, but our view of its value was too limited. Why should people pay for our park when there are other free parks in the city? We avoided this huge question for a long time. The answer: We could explain what outdoor play does to grow your brain, not just your muscles. We could help parents understand that getting outside and playing was not only healthy, fun, and beneficial, but also important. Playful, physical engagement can be a key ingredient for healthy brain development. We called our park The Brainasium and added neuroscience content to every experience. It’s challenged us to consider what other parts of human development our institution can nurture. The biggest challenge we faced was developing a brain exhibit that appealed to children from ages 3 to 13, the target audience of our science center, Ideaventions. To address this problem, we designed a multifaceted approach to hands-on neuroscience. For older children, we created a wall-sized version of a Stroop Test. Visitors can use our stopwatches to time how fast their friends or family can read 1) words or 2) the colors of the words. For younger children, we designed a low, accessible table with examples of brain anatomy. One side of this table featured five different examples of real animal brains mounted under plastic so that visitors could compare their sizes and structures. The other side of the table presented a plastic, realistic anatomical model of a human brain. To further engage children, we also supplied the table with magnifying glasses and enhanced it with probing questions. We find that our brain exhibit promotes layered learning, in which older children or parents help teach scientific concepts to younger children. Psychology: Understanding Ourselves, Understanding Each Other, which came to be known as the Psychology Exhibition, was developed by the American Psychological Association (APA) and the Ontario Science Centre (OSC), Toronto, in collaboration with ASTC. It opened in 1991 at OSC, and portions of it remained there as the Mindworks permanent exhibition for about 20 years. A traveling version of the exhibition opened at the Smithsonian’s Experimental Gallery in 1992, and went on to travel to 15 science museums throughout the United States over a period of four years or so. I served first as the educator on the exhibition team, and later as the project director. The exhibition was APA’s major public education effort in celebrating its centenary in 1992. Its goal was to demystify psychology: to introduce a broad, general science museum audience to concepts, tools, methods, and results of 100 years of psychological research. Among many challenges, two stand out. The first was achieving the goal itself. Through front end evaluation, we confirmed that for most people, the word “psychology” is associated with therapy and mental illness, and therefore carries a kind of stigma. What APA wanted to highlight in the exhibition was not the clinical branch of psychology, but its research arm. Research psychologists, like medical researchers, don’t work with patients. Instead, using the scientific method, they examine brain processes like cognition, memory, and emotions; social interactions; and human development from childhood to old age. With OSC science staff, designers, and exhibit developers (led by Hooley McLaughlin, Jerry Krause, and John Voskuil) who came up with ingenious exhibit components and hands-on activities, we worked very hard to make the exhibition about psychological research. Our sound-bite description of the exhibition became: Psychologists study the things that people do every day. People think, remember, forget, have feelings, communicate, cooperate, disagree, plan for the future, grow up, etc. These are the things that interest research psychologists. And we found, first through front end studies, and then as we prototyped various components, that the general public is also interested in these everyday processes. The second challenge was to forge a productive collaboration between two very different organizational cultures—that of a museum and that of a professional scholarly organization. Since the 1980s there have been a number of such collaborations, from the American Chemical Society’s contentious partnership with the National Museum of American History, Smithsonian Institution, Washington, D.C., on Science in American Life, to the American Anthropological Association’s collaboration with the Science Museum of Minnesota, St. Paul, on RACE: Are We So Different? No matter how successful the resulting exhibition, there are many layers of translation and negotiation that have to take place between the professional organization, whose chief aim is to present an accurate and complete account of their field, and the museum, whose mission is to effectively communicate this branch of scientific knowledge and to engage a broad general audience. These two goals are not incompatible, but the formats for communication (scholarly papers and research versus brief labels and hands-on activities); vocabularies and terminology; what constitutes “success”; and the physical milieu all differ greatly in these two organizational cultures. In the case of APA and OSC, several of us from the museum profession (project director Caryl Marsh, a psychologist and a museum professional; Baiba Sube Lennard, a graduate of the George Washington University Museum Education Program, and I—a museum educator and administrator) were hired by APA to develop the project. We served as a kind of bridge, employed by the professional association but with museum experience. Even with this arrangement there were many issues, e.g. the writing of label copy, which required a great deal of discussion, review, negotiation, and compromise. In the end, OSC developed labels that were perhaps shorter and simpler than the psychologists would have liked, but that were both accurate and engaging for visitors. Working on this exhibition was one of the formative experiences of my life in museums. It was intense, intellectually stimulating, and perspective changing. Those of us who collaborated on this project are friends and colleagues to this day. The Museum of Science and Industry’s YOU! The Experience focuses on the connections between the human mind, body, and spirit and their impact on our lives, health, and well-being. Within YOU! is an area devoted to Your Mind, and the biggest challenge was to integrate the brain’s anatomy and physiology with its emergent aspects that make up the essence of who we are and influence our lives and our health in big and subtle ways. We chose to focus primarily on human psychology—what influences our decisions, how risk averse (or not) we are, how we interpret facial and vocal expressions, and what catches our attention and why. In addition, we created an experience that directly links brain anatomy and function. Your Brain utilizes augmented reality technology to allow visitors to play a set of four games that include hand/eye coordination, puzzle solving, memory, and concentration. Visitors play the games and then explore the specific areas of the brain that were activated while they were involved with the game play. The combination of experiences in Your Mind creates an opportunity for a full and rich exploration of the visitor’s own way of thinking and experiencing the world. The Discovery Museums are planning a new gallery space targeted towards children ages 0 to 3 and their parents and caregivers. Tentatively titled Brain Building Zone, it will be a resource for parents to learn about neural development and to learn and practice skills that support it in their child. The exhibition is shaped by research on early brain development, thanks to an exemplary group of advisors from fields of child development, pediatric neuroscience, and academia. However, the biggest challenge relates not to the exhibition itself or the science behind it, but to communication: How do we effectively communicate to parents the critical importance of ages 0 to 3 and the essential role that parents can—and should— play in their child’s brain development? If we are successful at communicating these things, then we can help parents move forward to build skills that will support their child. We are prototyping communication tools with parents, having them play both the role of information consumer and producer. As consumers, parents react to pictures, quotes, and stories that model healthy parent-child relationships and early development. As producers, parents are given the opportunity to observe their own children and document the learning they see. Through this process, we expect to learn what communication approaches work best with parents, who are the primary audience for the exhibition. At the International Centre for Life, we are planning an exhibition at the meeting of neuroscience, psychology, and anthropology to present the ways in which we can investigate the brain. To reflect how science really works, we want to create exhibits that are based on research experiments. These could be existing experiments, where the findings are known, or new data-collecting experiments where nobody knows the answer. We know that there is a massive public appetite for definitive information, so our challenge will be to create fun, engaging activities where there may not be a definitive answer yet. We need to work out how to make “not knowing” a positive result. “Is that real?” A boy presses his nose against the glass, misting the side slightly as he speaks. The scene sums up why we decided to exhibit a real human brain in At-Bristol Science Centre’s exhibition All About Us. It is reassuringly difficult to obtain and display human tissue in the United Kingdom, but with the help of the University of Bristol it wasn’t long before we had a list of potential donors and a license. The biggest problem remained: How could we quickly convey to visitors that this is a real brain from a real person? First, we decided to display the specimen in a sleek tank engraved with the image of a person to help focus visitors on the humanity of the donor. Second, the exhibit is out in the open so you can get up close. Finally, we offer a series of films telling the story of brain donation from different perspectives—potential donors, surgeons in training, a donation coordinator, and an anatomy lecturer. We have a lot to thank our donor for—our exhibit continues to engage visitors, and next year we’ll be furthering our journey with support from the Wellcome Trust. Our new BrainLab sessions will follow the journey of a fictional patient through diagnostic brain surgery, presenting real human tissue samples in what we hope will be memorable learning experiences. Funded by the (U.S.) National Institutes of Health Blueprint for Neuroscience Education Program, the University of Montana spectrUM Discovery Area’s Brainzone and Brainlab bring real-time research from the university’s Center for Structural and Functional Neuroscience (CSFN) to the museum floor and mobile science program. Our greatest challenge lies in translating CSFN’s high-level laboratory research into accessible, inspirational learning experiences for all. The museum educators and neuroscientists on the project have learned to embrace the fact that we come from fields with different values, cultures, and even languages. At spectrUM, we are driven by a community-based approach that is designed to empower the next generation of Montanans to believe they belong in science, technology, engineering, and math (STEM) and higher education. CSFN shares this value but most strongly prioritizes communicating current, authentic research and science. Through this partnership, we have developed shared culture and, ultimately, a richer experience for our learners. We also have found that our Brainlab manager, Amanda Duley, is instrumental in project communication: with experience in research and informal science education, Duley serves as an invaluable liaison. One of the challenges in producing interactive experiences about the brain in the Life Lab exhibition at the Marian Koshland Science Museum was showing the dynamic nature of brain development over time. When we created the Brain Garden game, we needed to quantify the impacts of education, health, and lifestyle choices on the brain. Weighing the negative impacts of an event like having a stroke in relation to the positive effect of choices like early childhood education wasn’t simple. In the end, we developed a game that reflects some of the multifaceted experiences that influence our brains. Erika C. Shugart, former deputy director, Marian Koshland Science Museum of the National Academy of Sciences, Washington, D.C.
People are increasingly interested in neuroscience as a result of health issues related to the nervous system and science discussions about the mind, intelligence, and emotions. Museu da Vida has been exploring neuroscience since 2010 through our Celebrating the Brain (Celebrando o Cérebro) thematic event, part of the Brazilian Brain Awareness Week. Past themes have included Senses (2010), Language (2011), Memories (2012), Emotions (2013), and Different Views of the World (2014)—and the theme for 2015 will be the Art and Science of the Brain. For 2016, we are planning a temporary exhibition on neuroscience that will bridge the lay perception of the nervous system and state-of-the-art knowledge from the scientific community. The biggest challenge for popularizing neuroscience is dispelling the myths disseminated by the mass media, such as “We only use 10% of our brain” (such as in the recent film Lucy) or “Smart people have big brains.” However, these popular misperceptions can be the gateway to new interpretations. To help participants challenge their previous ideas, we enable them to explore brains on the macro level (by looking at real brains, touching 3D models, and coloring drawings of the brain) and the micro level (by observing neuro tissues and neurons). Our new exhibition project is based on a triad: (1) ambiance to immerse individuals and allow them to integrate the content from exhibits with information provided with successive layers of depth, (2) the use of interactive devices for exploration of content and collaborative activities, and (3) facilitated workshops and opportunities for dialogue about the exhibition. Scientists know a great deal about early childhood brain development and they are learning more every day, but as a society we have done very little with this information. Wonder Years: Science of Early Childhood Development at the Science Museum of Minnesota aims to bring information about brain development to the public so that we can be better caregivers and advocates for our youngest citizens. This leads to the project’s biggest challenge: How do you create an exhibition about very young children for all of the adults in their lives in an environment that needs to engage audiences of all ages? To address this challenge, we designed an exhibition that gives museum visitors of all ages opportunities to see and feel what it is like to be a young child; to view young children, via video, participating in tasks illustrating stages in cognitive development; and to engage with the children they are visiting with in dynamic spaces. Visitors looked through goggles to see what young children see; wrote their names while looking in a mirror to remember the frustration that comes with learning a new skill; viewed videos of positive adult-child relationships and children trying to complete cognitive and physical tasks; and interacted with young children in areas designed for reading, dramatic play, and cognitive development tasks. The result is an exhibition that tackles a serious topic while engaging multiple generations of museum visitors. Once we decided to include a brain exhibit in the Hall of Human Life at the Museum of Science, the biggest challenge was framing the content and deciding what topics would be relevant to the public and yet easy to grasp. We therefore approached this topic from clinical, academic, and public health perspectives utilizing advisors from each field. We wanted to focus on a health condition that changes with time and is influenced not only by our genetics and physiology but also by environmental factors. That is why we picked major depression. That was not a decision that was easy for advisors and staff to accept at first as we were all aware that visitors do not anticipate thinking about depression during a museum visit. The fact that the exhibit has been well received has affirmed our mission to make accessible the science behind who we are. Two successful activities include a facial recognition interactive and a hands-on light up brain. To explore the topic of brain injuries and concussions, the Ontario Science Centre developed a novel interface in The AstraZeneca Human Edge exhibition that allows visitors to strike the head of a crash test dummy by operating an impact arm attached to a pendulum. They discover that—depending upon the location and speed of the impact—helmets do not adequately protect against rotational forces to prevent concussions. The biggest challenge in developing this exhibit was coordinating the complex mechanical and electronic components. Extensive testing and several iterations were required to ensure safe and reliable operations. In addition, we were uneasy about visitors walking away with the message that helmets are ineffective, so we developed a display of helmets from real crashes, featuring stories of how helmets saved lives. Finally, it was a challenge acquiring scans of brain injuries and the appropriate impact data. We were able to overcome this by developing strong ties with experts from several university and health care institutions. Pacific Science Center recently opened Memory: Past Meets Present, funded by the Paul G. Allen Family Foundation. This exhibition features the research of Seattle-area scientists and investigates our memories, how we remember, and how we trick our memories. We experimented with crowdsourcing images of other people’s memories to incorporate into the fabric of our exhibition. It was difficult at first to get good high-resolution responses, but time was our friend and putting out the call for submissions over months rather than weeks was the key to success. In addition, setting up easy and specific photo delivery protocols and prizes for those photos ultimately used in the exhibition encouraged our visitors and eased our management of the process. Every year, over a four-year period, half of this exhibition will rotate with new content and the other half will remain the same. We will apply these lessons to the 2015 version of the exhibition to help us keep the permanent elements fresh and incorporate the next generation of content.